Dr. Kraklow specializes in kidney disease and caring for patients receiving dialysis. His primary concern is to ensure patients are educated about treatment options and their disease process so they can be an active participant in their care. Dr Kraklow is a native of Greenfield, Wisconsin and he graduated from the Medical College of Wisconsin in 1992. Since 1998, Dr. Kraklow has been a Clinical Adjunct Assistant Professor of Medicine at the University of Wisconsin Medical School. He has received numerous honors and awards in teaching. Dr. Kraklow is the Medical Director of Fresenius Medical Care Dialysis Kenosha and Racine Facilities. 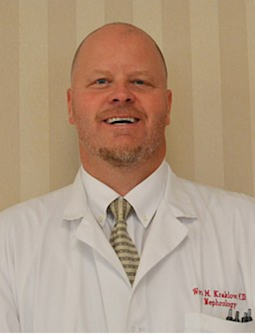 Clinics to see William Kraklow, M.D.